We all know how many hours there are in a day but making the most of them can seem like an eternal struggle. Probably none of us uses every minute of every day wisely, but a lot of us could possibly take back a few hours here and there if we gave ourselves the chance to actually think about what we are doing. If you are one of those people who find it difficult to prioritise sensibly – and most of us do to some extent – then understanding what is urgent and what is important could be the key idea to helping you become more successful. So in the context of the time available to us what is important and what is urgent? I learned early on, thanks to my genuine dislike for repetitive tasks and recurring issues, that if you spend your day fighting fires then, much like a hamster mesmerised by its wheel, you get nowhere fast. If you get into this exhausting situation, then you are possibly caught in a cycle of dealing with urgent short term fix tasks rather than dealing with the important tasks which are best for you and your business in the long term. How often have you felt really busy but at the end of the day wondered what have you actually accomplished? You have been very productive; checked your emails, responded to everyone’s questions and problems, filed things away and ticked things off the to do list. At the time, it all felt very important and it certainly kept you very busy. But, reflecting on your day, you wonder if any of the tasks which you attended actually matter in the long run? Could some of it have seemed urgent yet in hindsight not been that important at all? The key to managing your workload effectively is to identify what is important and then, hopefully, you will prioritise appropriately and automatically. Now I usually groan out loud when I see a two by two matrix. I have seen so many of them used so badly over the years that I feel like shooting myself everytime I see one. I make an exception in the case of the time management matrix popularised by Stephen R. Covey as I find it a really useful tool for visualising this particular idea. It’s based on the the idea that all your time spent on tasks can be categorised in a matrix. You can’t change the size of this matrix – as it represents the time that you have, that’s your life. But it is possible for you to drastically change what you do with that time, in respect of changing the size of each of the four quadrants. Have a look at all the tasks you carry out during the day and see where they fit into the matrix. After that, have a look at all the tasks that you would like to do and never get round to doing and see where they fit into the matrix as well. 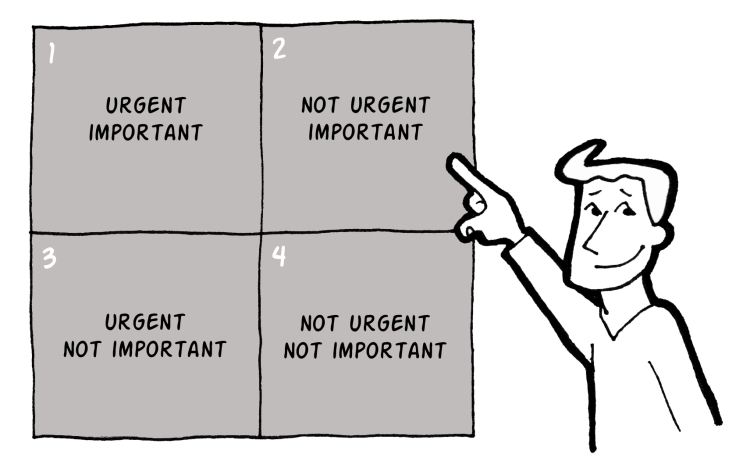 The Quadrant of Necessities – these are reactive tasks, the stuff that must be faced. It needs to be done and it needs done pronto. Examples include crises, daily ‘fire-fighting’ and imminent deadlines. If there is a crisis, it needs to be attended to. If there is an issue or a problem which is impeding your business then it needs confronting. Despite this immediate necessity dealing with these matters are not likely to advance you towards your goals in the long-term. They are just about keeping you on track by avoiding further escalation of issues and problems. Be aware that many entrepreneurs can become trapped in performing this type of work. It can be exhausting and ultimately is a very hard route to success. If a large amount of your work is in this quadrant then this is a warning sign that change is necessary. The Quadrant of Quality – proactive tasks. These maintain or improve the quality of your work and life. This is the supremely important quadrant as, it is to me, one of the fundamental building blocks of success. The most successful and motivated people tend to spend most of their time on things that are important and not urgent. Their work in this quadrant reduces the need for daily firefighting, and their ability to prioritise and focus on the long term eliminates much of the self-deception and waste that can plague our daily lives. When things get tough many entrepreneurs tend to drop these tasks first which can create a vicious circle. Examples include maintaining and building relationships, getting new customers, regular exercise, healthy eating and learning new skills. The real challenge is to make sure these things happen all the time no matter what is happening elsewhere. The more of your time is focussed on this area the more likely you are to be successful. How can you dedicate more of your time to these tasks? How can you motivate yourself to make the non urgent urgent? The Quadrant of Deception – It is too easy to be doing things that really don’t need doing, such as ineffective meetings or looking and and answering every email in your inbox. The demanding ring of the phone or a member of staff asking a question is easy to get distracted by. Although picking the phone up might seem the right thing to do in the short term, it could be a waste of your precious time. Similarly, it is easy to gratify the need for attention from an employee who can actually get on fine with their work without any lengthy discussion. Again, this is time that might be FAR better spent in Quadrant 2. The challenge is to recognise these tasks and somehow avoid these immediate requests for your time. Rather than helping to fulfill your plans, in business and in life, they are distractions. And they can take away your precious time if you let them because of this illusory necessity – by definition, they are not necessary to you. This is the toughest place to get free from as it generally involves the demands of others. It involves saying no and being disciplined enough to focus on your long term goals. Time can be freed from here but it may not be easy. This quadrant serves no purpose to anyone so in some ways it is the easiest to get rid of. There is no one crying out for these tasks to be done and there is no long term need for any of this to be done. These are the things to just snap out of and this valuable time can be channeled into something that is much more useful. This is the quadrant of easy wins. If you are performing tasks in this area then stop it now. Do something important for the long term instead. 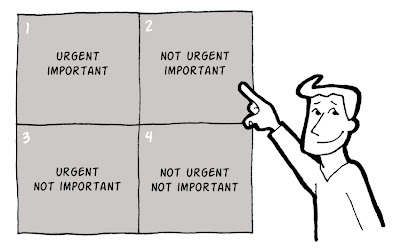 How much of what you do today is in Quadrant 2? Are there things that you can stop doing? Are there more important things that you could be doing? As an entrepreneur you have complete freedom to set your own workload. The key to good management is planned prevention of time-wasting. It is about clawing back time from Quadrants 3 and 4. Problems become smaller and less frequent if you spend time in Quadrant 2. Then you get time back from Quadrant 1 too. And so it snowballs on, all from allocating time to Quadrant 2 in the first place. The best strategy for those that can is simply planning to work in a more effective way. Schedule your week’s tasks with a keen mind staying focussed on what is important in the long term, and weeding out what isn’t important. This should take clear account of working towards your ultimate goals; those very end results are all-important, at the start of your planning. If you feel that you are never going to get away from dealing with the urgent things in front of you then don’t fight the tide. If you struggle to ignore the urgent it then don’t try to do it. Embrace your weaknesses and develop solutions that take account of them. I say give dedicated resource to those important and non urgent areas and make sure these things happen without your input. That way they can’t get distracted by other people’s priorities. For example if you want to get free from e-mail then employ someone to read and filter your e-mail for you. If you want to still get new customers even when you are busy then pay someone to get you new customers or develop hands off ways of generating new customers. If you want to get fit then pay someone to get you fit. We live in an era where it is possible to hire people by the hour to do just about anything. We also live in an era where most things can be done remotely at relatively low cost. If you struggle with getting rid of the constant demands of others then make sure that someone who is free from those demands is getting the important long term things done for you. The important thing in this is to recognise that working on unimportant things is not going to get you where you want to go. Find a tailored solution that works for you so that the good long term things happen. How much of what you do every day is important in the long term? How much of what you do today is getting you to where you want to go? Consider everything you are doing and make sure all your time counts.